Slowly but surely, New York's quest for authenticity is improving the quality of pizza in the city. The legends of New York-style pizza: DiFara, Patsy's, Lombardi's, Grimaldi's, are facing a wave of new comers bringing traditional Neopolitan-style pies to the Big Apple. Instead of extra large crispy pies overloaded with mozzarella and globs of olive oil, which make no mistake are still delicious, Neapolitan pies are more restrained: smaller, lighter, elastic, and sparse with cheese and saucing. Fork and knife are required. 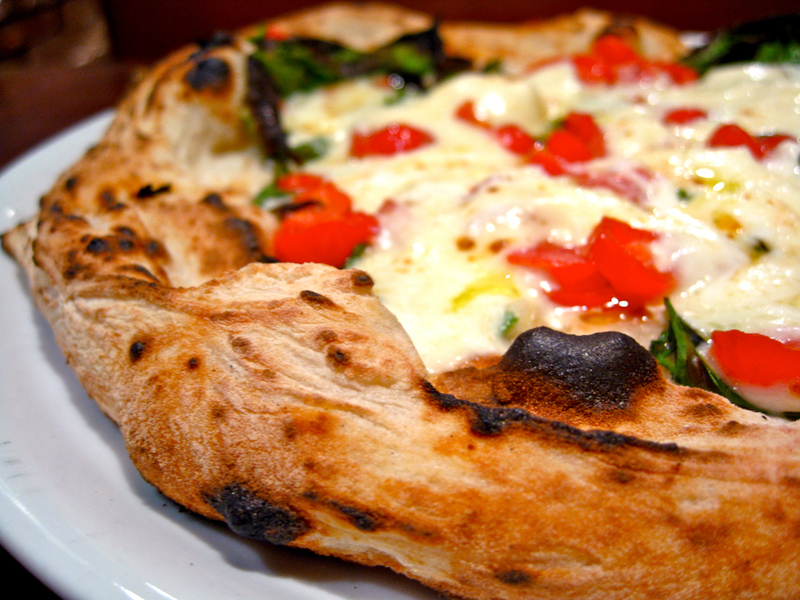 Unfortunately, there aren't too many places in the city that serve an authentic Naples pie. 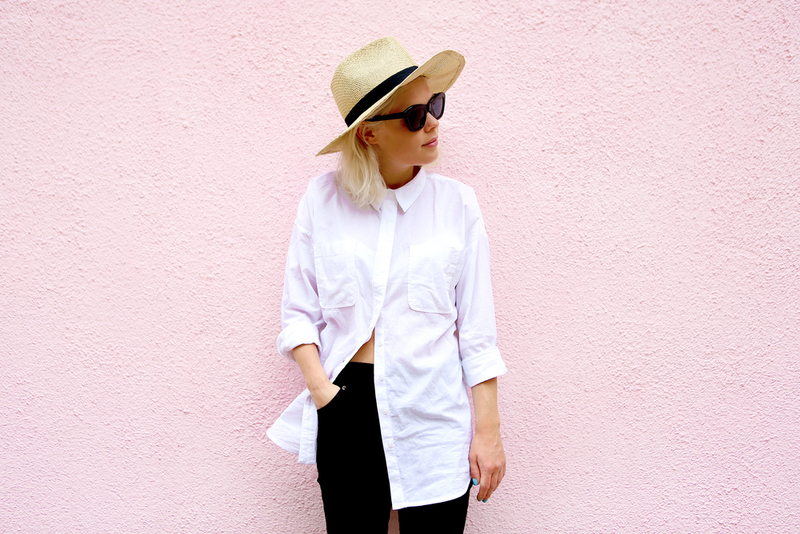 Kesté is one of them, and it serves the best. 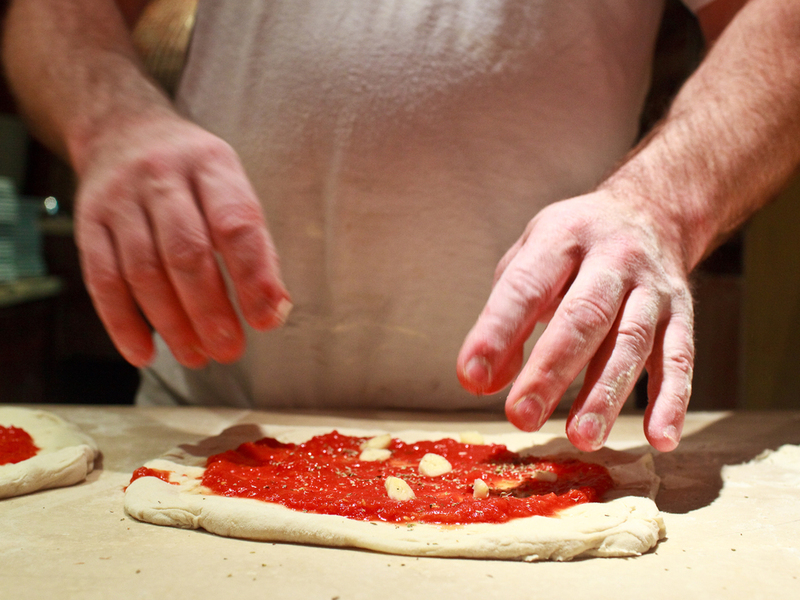 Roberto Caporuscio, chef and co-owner of Kesté Pizza & Vino, is a pizza master. 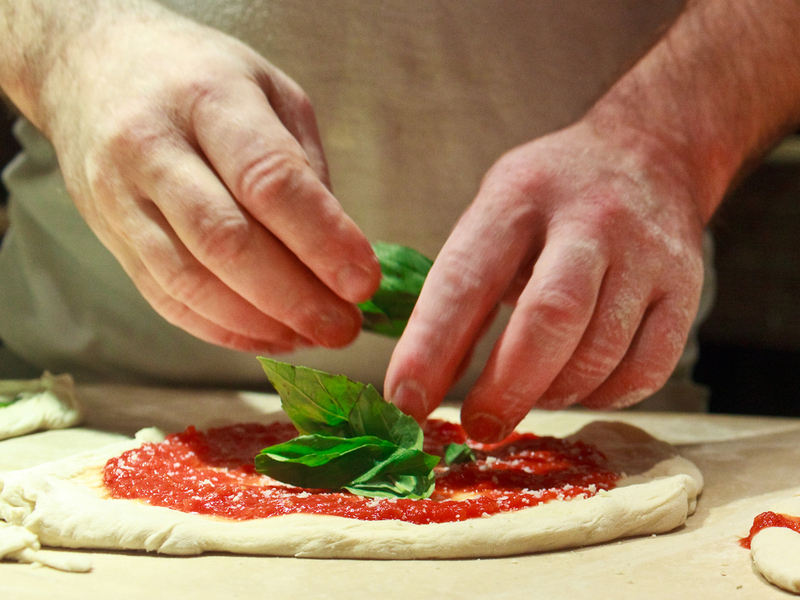 Chef Caporuscio comes from Pontinia, Italy just over an hour north of Naples, the putative birthplace of pizza. After several years of training in Napoli he ventured to the United States to share this traditional style of pizza without compromise. New York-style pizza wasn't for him. Despite being the president of the Associazione Pizzaiuoli Napoletani, he is rarely found outside of the kitchen. And if he is, his hands are always covered in white dust. Roberto's enthusiasm for making the perfect pie can be seen almost immediately by watching his slow precise hands working the dough, his eyes almost never straying from the pie. The dining room is modest, a long narrow corridor with simple wooden tables and chairs lining both sides. On a Saturday night (actually any night, for that matter) the brick walls echo the groans and sighs of a jam-packed room full of ecstatic diners. Kesté does not take reservations, and since the word got out that "this is it" (the rough translation of "Kesté" from Neapolitan dialect) be sure to arrive early. The menu features authentic items such as the pizza margherita and pizza marinara, as well as more original creations involving squash, mushrooms, truffle oil, and other unique assortments of seasonal ingredients. I've heard purists cite the variety of Kesté's menu as a weakness, saying Naples doesn't have "salad pizzas." While that's probably true, this isn't Naples and the clientele isn't from Naples; unless you're David Chang, having a restaurant in New York without light and vegetarian options is operational suicide. Good luck. Fortunately, Chef Caporuscio uses this to his advantage: the creative pies are still baked in the Neapolitan way, just with toppings to please the diner. However if you're a member of the cultural police, stick to the first few items on the menu. Pizza Margherita - A soft and pliable dough, just over a foot in diameter, with crispy charred black spots decorating the rim. The pie was adorned with molten globs of fresh mozzarella, tomato sauce, and crispy basil leaves. In a wood-burning oven this hot, pizzas cook in under a minute. While I tried to use my hands at first, the soft eye of the pizza quickly told me a fork and knife would be easier. Each crack with the knife sent a puff of black dust onto the table. This pizza was just as much fun to cut, as it was to eat. The flavor was extremely fresh and subtle, reminiscent of the first time I made marinara sauce with canned tomatoes. The high quality mozzarella cheese nearly made me reach for the salt shaker, until the subtle sweetness of the tomatoes shone through. This pie was in perfect balance. It's always a battle with pizza: eating too quickly will result in a burnt tongue; but wait too long, and the cheese hardens. As tempting as it is to take an immediate bite, I usually try as hard as possible to wait a minute for the molten tomato sauce to cool to a safe temperature. However Kesté's pies are no bread bowl: sauce is applied sparingly so the cooling time is much quicker. I find thirty seconds to be ideal. At least, that's the extent of my restraint. Pizza Marinara - The lightweight cousin to the Pizza Margherita, this pie has no cheese. The same elastic crust is garnished with bright red tomato sauce, slices of roasted garlic, thin crispy basil, and a drizzle of olive oil. There are few things in the world as satisfying as this. There was a bit of a line on my first trip to the sole bathroom, which afforded me the opportunity to watch Chef Caporuscio in action. He could tell that I was curious, and without taking his eyes off the pizza, managed to keep a conversation. He was genuinely interested in talking about pizza, the places that do it right while omitting the places that did not do it so right. He explained his passion for finding the right ingredients and for methodically assembling and baking them in just a few minutes. I watched as he pulled a pie right from the oven into the trash, "a little too charred on the edges," he replied. He was a perfectionist. Mast'nicola - A pie from such an ancient recipe that it doesn't include tomato sauce. Thin and translucent slices of lardo and basil are spread over the dough and crisped in the oven with a dusting of Pecorino romano. I feared this pie would be dry. It wasn't. It was this pie that awakened me to Kesté's true secret: the crust. Part elastic, part crispy, part chewy, part dusty, this crust expanded the entire gamut of texture. It formed a perfect foundation for a variety of topings; but frankly, could easily be enjoyed by itself. Ripieno (Calzone) - Tomatoes, ricotta, fresh mozzarella, salame, extra virgin olive oil. A pizza folded in half, overflowing and oozing with warm mozzarella and ricotta. Hidden strips of spicy salame were buried under the crust, adding a meaty salt to the overall flavor. I've tried on various occasions to get Chef Caporuscio to make a calzone of just ricotta and mozzarella with no tomato sauce and no salame; but every time I got the same dish with a note from the waiter, "Roberto says it doesn't taste so good like that." I just wanted to compare this calzone eye-to-eye with my favorite from DiFara; because frankly, this might be my new favorite. Salsiccia e Friarielli - Chunks of sausage and a vegetable similar to broccoli rabe. The crust was outstanding; but I don't care much for smoked mozzarella. This was the special pizza of the day, often spontaneous and impromptu creations by the chef. While I did enjoy this; I'm not too sure I would order it again. Tiramisù and Tiramisù alla fragola - Regular and strawberry tiramisu, moist and wet with a clearly defined shape. The taste of coffee was very light, which I appreciated. Panna Cotta - Firm and rich, with a delicate hint of vanilla. Torta Caprese - A dark chocolate and walnut cake spiked with limoncello. This was very heavy and I would only recommend it for those with a rather large appetite. Delicious, nonetheless. Regina Margherita - like a Pizza margherita only with grape tomatoes and buffalo mozzarella. The added acidity of the tomato skins cuts through much of the cheesy mouth-feel from the traditional margherita. 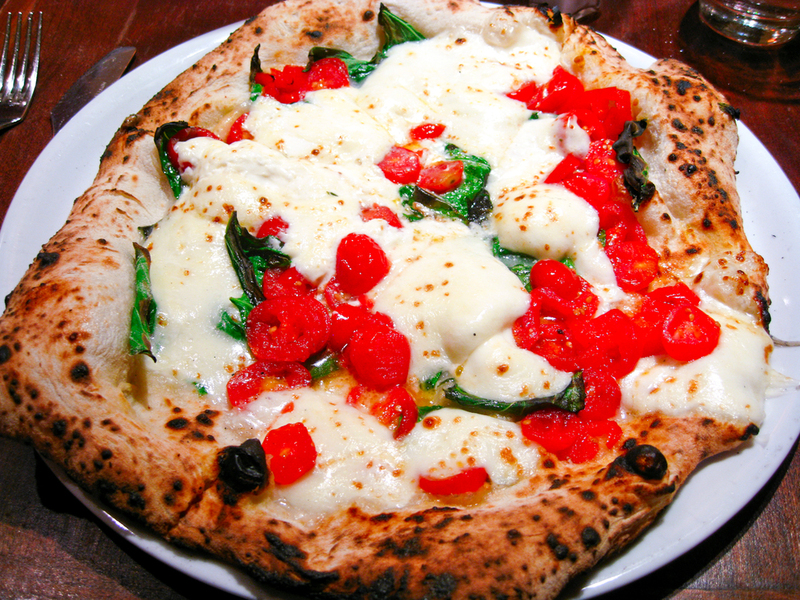 A similar pie, only with burrata instead of mozzarella, is available sometimes as a special. I highly recommend trying the later if it's available; but only with a large appetite. The squeaky mozzarella spills off the pie onto the plate. It's almost like drinking cream. Prosciutto e Rucola - Large layers of prosciutto layered over raw arugula. An obvious choice for salumi lovers looking for something light. 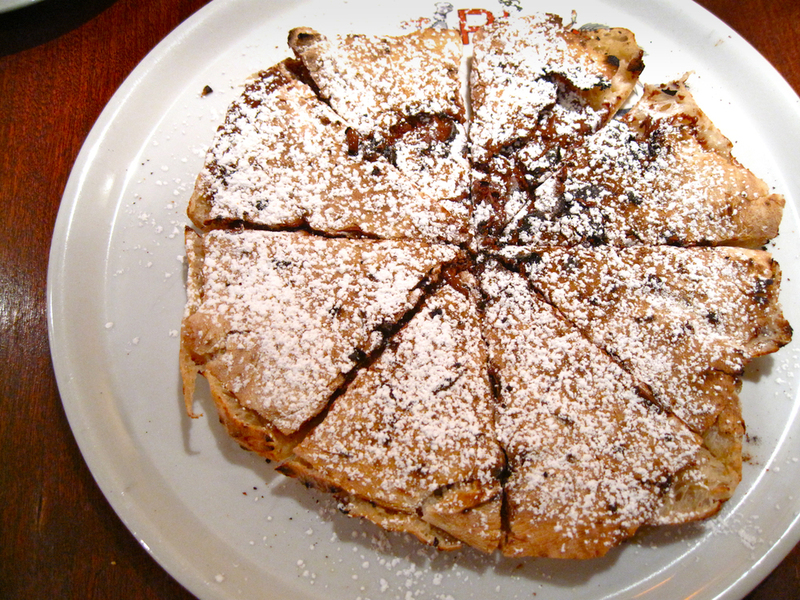 Pizza alla Nutella -Kesté's signature crust sliced horizontally and layered with nutella. The whole pie is then dusted with sugar. Really now, try to think of a more appealing dessert to share. It's exceptional (and apparently authentic, says the Chef, too). Kesté is the best thing to happen to New York's pizza in a long time, and I find myself constantly returning for another exceptional pie. It's just always the right decision, for lunch, for dinner, with family, or with friends. And the staff is kind and accommodating, the service prompt and responsive. I highly recommend that everyone visit, and am counting the days until I return to New York.